"...there have been incidents of new roads being created by motorists and the destruction of Joshua trees in recent days that have precipitated the closure..."
Went through the border today at Sumas after a few days up at Whistler. The border guard seemed so sad and just went through the motions. How would you feel if you were forced to work without payment for over a month on fear of termination? This is supposed to be for border security? Yeah for better or worse I had my easiest Sumas crossing ever this past Saturday. None of the usual high pressure testing tactics there, despite my having a Canadian passenger on board who was coming into the U.S. For business meetings (and who is picked up in Canada). The out house at Staircase is locked shut. Someone went up there after New Year's day and locked it. Shutdown is over (atleast temporarily). Wonder how soon they'll start plowing the road to Paradise. Thanks Schroder. I've only been looking at the webcam of the visitor center, so this is good to know. 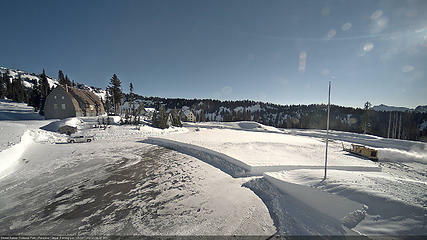 I believe they have kept the road plowed, but based on the webcam views of vistor center from the guide house the parking lot and it looks deeply covered. I think they will need at least a snow blower to clear the lot, if not a loader. If Murphy has his say, the "road to Paradise" will re-open in 3 weeks, just in time for the next shutdown. Port Angeles, WA – With the enactment of the continuing resolution, staff at Olympic National Park will begin working to restore regular winter operations on Sunday, January 27. Due to storm damage that occurred prior to the lapse of appropriations, many park roads and campgrounds remain closed. Park staff will start assessing damage, clearing downed trees and storm debris from roadways and campgrounds, and reopening areas as quickly as possible. Please visit www.nps.gov/olym/planyourvisit/conditions.htm for updated information about the park and current conditions. On Sunday, January 27, the Olympic National Park Visitor Center in Port Angeles will reopen at 9:00 am. Normal operating hours are 9:00 am to 4:00 pm daily. On Monday, January 28 a majority of furloughed staff will return and begin opening the remaining park functions. Hurricane Ridge Road winter operations are scheduled to resume Friday, February 1. Weather and road conditions permitting, Hurricane Ridge Road is open Fridays through Sundays. Call 360-565-3131 for road status updates and weather information. All vehicles, including 4-wheel drive, are required to carry tire chains. For more information on visiting Hurricane Ridge in the winter, visit https://www.nps.gov/olym/planyourvisit/hurricane-ridge-in-winter.htm. The Hurricane Ridge Ski and Snowboard area is operated by the Hurricane Ridge Winter Sports Club. Visit the Hurricane Ridge Ski and Snowboard Area website at www.hurricaneridge.com for additional information. The park asks for patience as employees work to reopen facilities and operations in a manner that is safe for them and the public. There is a lot of storm debris, downed tree removal, and safety checks that must be completed. The park extends a special thank you to our local communities who provided incredible support over the last 35 days for our NPS family. Olympic National Park’s employees are happy to return to work serving the American people and welcoming visitors to Olympic. Plowing now, looks like a few feet of snow has fallen in the last month! Look at all the snow since the US Gov't shut down.